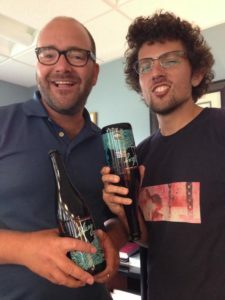 After a few false starts on a rather busy week, we we able to get together over the phone with Ryan, Hank, and Lead Brewer Brian Hink to talk about the Barrel-Aged Series and it’s latest release, The Skeg. How was The Keel received? Ryan: Oh, it was incredible, right? It was great. I mean, we got a 94 on Beer Connoisseur, everybody loved it, I thought it tastes great, it was complex, and we give [Head Brewer Brian Hink] full reign in allowing him to do whatever it is he wants to do and explore. So it’s really in the R&D phase for us, to be able to have this mixed fermentation, barrel aging. And to come right out of the gate with a really strong beer is all we could ask for. Do you think The Skeg is going to live up to the success of The Keel? Ryan: Yeah, we don’t know. We haven’t done a tremendous amount of research but we’re going with our gut. And one point I want to bring up about our R&D stuff is that we invest a lot of money into making that happen and a lot of time into making it happen. We could, otherwise, take that money and use it to increase capacity and make our beer more efficient. But we choose to invest in exploring different ideas and concepts. And that’s what this is. Quantity-wise, did we make more of The Skeg? Is it as limited as The Keel? Hank: It’s just as limited. How does The Skeg differ from The Keel? Hank: It’s very different. Me and Ryan both tasted it, and I wouldn’t even put it on the same spectrum as The Keel. It’s a whole different flavor profile. Hank: It’s pure Brettanomyces. All the flavor that I get. It’s purely the funk. Without the sharp sourness that The Keel has. Brian: It’s just a completely different beer. It’s still a weird beer — you can definitely say that about all the beers that come out of that program. They’re definitely different. The beers are very, very different. They’re unified in that sense of it, where they are an adventurous beer. You really gotta go in with the mindset that you’re going to expect something very, very different out of it. It’s not gonna be something that you’ve had before. So, those are some of the similarities, but the similarities kind of end there: the approach you’ve got to take to it. With The Skeg, we wanted to focus more on the Brettanomyces playing off the hops. So, with that, we took a double IPA with a really simple grain bill that’s all about the hops to begin with, we aged that in the wine barrels for three months. Got a little bit of wine character, got a little bit of the oxygen ingress into the barrels, a little bit of that does come through. So you get a little bit of oxygenation and the Brett does play off of that — the term is “microoxygenation” — just a little bit of oxygen ingress over time. That keeps feeding the Brett. And the Brett just kinda ran wild with it. The Brett really plays off the hops. And the grain bill is so simple that it really doesn’t get in the way. And we didn’t want to make this one nearly as tart as The Keel, it’s definitely toned down on the acidity level. It’s there, it’s definitely more acetic than a normal beer would be, but it’s not a puckering, you-bite-into-a-lemon style sour beer. The tartness is definitely more subdued, more background, more complementary — it’s like adding a pinch of salt to a good steak. That’s what the acidity does to this beer. Whereas the focus, the main course of this beer is definitely the Brett playing off those hops. Four different strains of Brettanomyces in the barrel with the beer for a couple months. Hank: What strain do you think is the predominant strain? Brian: There are four different strains, all from commercial laboratories. Two of them are the same, just from different laboratories. Hank: Which makes them different. Brian: Which makes them very different, absolutely. Mostly, Brett lambicus and there’s two different strains of Brett bruxellensis, and there was a Brett claussenii. So there’s those four different Bretts playing off each other, and it really influenced the overall flavor profile of this beer. 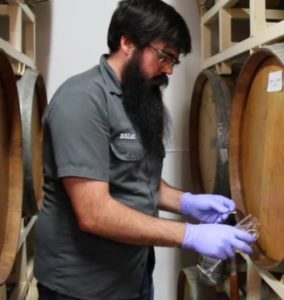 The Brett lambicus, for example, is what we winded up using for the Turtle Gut and that’s a big influence in a lot of these barrel-aged beers. And that one just brings a whole other level of rustic, funk, all those fun descriptors. Hank: Scott, have you ever heard the descriptor “wet horse blanket”? Hank: Tell the consumer that if they want to know what a wet horse blanket smells and tastes like, they should buy The Skeg. Hank: Pungent. Wet hay… You hear “barnyard” a lot. When you hear “wet horse blanket,” who the hell knows what that means. Who knows what a wet horse blanket smells like? I think we can all imagine. Brian: Leather. And there’s also some bad funk. If you don’t treat the beer properly in the barrel, you’re gonna get some “smoky band-aid” or burnt rubber. Those are things we don’t want. Those are phenolic compounds that happen to Brettanomyces. And we don’t want that. Probably one out of every ten barrels becomes a dumper because of too much ingress of oxygen and too much heat fluctuation. It gets too hot a lot of times. That was a really long tangent. Hank: It’s awesome. And I think Brian would definitely say that it’ll live up to the success of The Keel. So how long did we barrel-age The Skeg? Brian: The Skeg, as I said, spent three months in the red wine barrel. And the only reason it was only three months was that we were hoping to release these beers a little sooner. We wanted to get it right. There was no timestamp. You know, “These beers have to come out NOW.” We wanted to get everything right from the packaging, to the name, to the description. How we package these beers. You know in January, when we wanted to start with all this, we probably would have had more inconsistencies with it. That’s something that [Director of Brewing Operations Jimmy Valm] definitely brought to the table was after filling it, the process that he took to it, where we age it, how we age it, he definitely had a lot of influence on that. And I said it’s good that we waited. So after we barrel-aged it, we dry-hopped it after that, correct? Brian: Yes, once we got it back into stainless. And getting it back into stainless was important because that’s going to halt any further ingress of oxygen. The Brett’s still gonna play around in there, but it’s a more stable environment than in barrels, so it spent a few months in stainless tanks waiting to be packaged. And we held off on dry-hopping it until about two weeks prior to packaging it. That way, if you drink it fresh, it’s gonna drink like a slightly funky IPA. You gonna know you’re drinking something different, because the hops are very present. Hank: A very funky IPA. Brian: A very funky IPA, yeah. But the hops are still very prevalent and as it does age out, it’s still gonna be there, but it’s not gonna be the same. The Brett’s gonna continue to metabolize the hop compounds, and it’s gonna convert them — something called “biotransformation” — and that’ll continue to evolve the flavor and the aroma in the finished product. So you’re gonna lose some of that aroma over time, so we did hold off until just before packaging when adding the dry hops to it. I understand The Skeg has champagne yeast in it? Brian: Um, yes and no. We use champagne yeast to bottle condition it. It’s a very neutral flavor compound, and that’s just to help carbonate the beer in a very quick manner and to not stress out the Brett. So we just used that to carbonate the beer in a non-stressful environment for the Brett. So there is champagne yeast in the package, but it’s not anything that’s noteworthy. Hank: It’s not gonna develop flavor or anything. Hank: It’s just there to carbonate in a controlled manner. Fair. So now we discussed how different the two beers are — The Keel and The Skeg. Is that the hope for this series, that they’ll all be completely different? Brian: Um, yes and no. We want each one to stand on its own. We don’t want, you know, “Oh, this is The Keel. This is A Variant on The Keel. This is Another Keel.” That’s fun, and there’s definitely a time and a place. But right now, we’re new to it. And we wanted to have fun, run wild with it, really let our imaginations really get crazy. The first three releases — The Keel, The Skeg, and eventually The Scupper — are all completely unique on their own, but they do have some similarities tying them all together. In time, yeah, we’ll probably see some consistency. Maybe we’ll do The Keel once a year, maybe. But for now, it’s like, “Let’s have fun with it and really get creative.” See where we can go with it. Hank: And, Scott, even if we wanted to make The Keel again, it wouldn’t be the same Keel. It’s always gonna be a little bit different. Even if we followed the same exact process as the first time. With this program, there are things that are out of your control. You know, the barrels can change over time, the weather, maybe the different times of year. There’s so many different variables, and just the concentrations of different bacteria and yeast that we’re using, that even an identical Keel would fail. If we did The Keel again, it would be The Keel of 2017 or The Keel 2018. Brian: And if we went that route, you know if we’re calling it “The Keel” and keeping the same name, we would attempt to replicate it as much as possible. There will be many similarities, many hold overs, but it would definitely be year-to-year [very different]. Hank: So the engineer in me hates the variables in uncontrolled fermentations like that, and the brewer in Brian loves it. So how did The Skeg turn out? Brian: I think it came out great. It has something for everyone in there. I think Ryan’s the biggest hophead I know, and I think he enjoyed it. Brian: If you’re a fan of sour beers, of experimental beers. If you just like a Belgian beer or saisons or a Belgian Strong, it’s definitely going to appeal to you. It really has something for everyone. Hank: Even the novice. 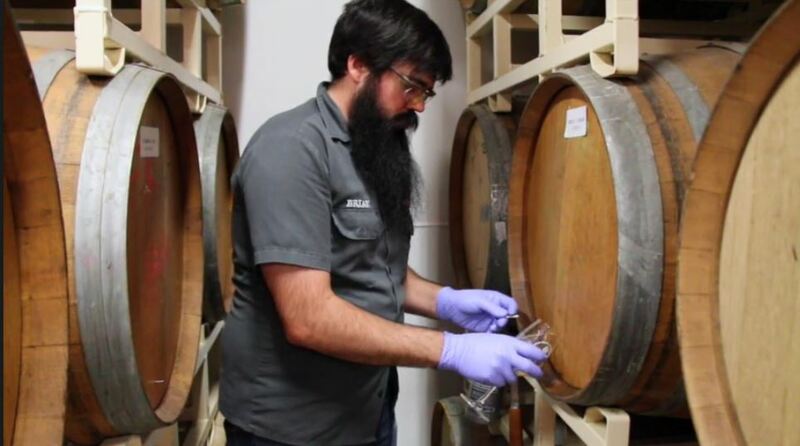 Someone who’s never touched a wild beer or a sour beer or some weird fermented beer, but they’ve heard the word “funky” or “earthy” and they’ve wondered what that meant, this beer is gonna be able to give that to them. It’s got that funky and earthy flavor and aroma that they’re gonna be able to connect the descriptors that they’ve heard with an actual flavor and aroma. The Skeg releases from the Brewtique at 11am, Saturday, September 3rd. Limit three bottles per person. Director of Brewing Operations Jimmy Valm and Head Brewer Brian Hink have been dying to check in with our releases in the Barrel Aged Series, and now that The Skeg has just about hit its six-month mark, we decided to let the guys out of the box and have a field day. “Oooh… that Brett is really starting to speak volumes, now,” Jimmy says. “It’s definitely more woodsy. I definitely get more of the barrel character, now,” Brian says. “It’s aged incredibly well,” Brian says. “It’s really, really nice,” Jimmy agrees. Check the video to hear more, and let us know what you think about your cellar-aged brew in the comments.